This is a Bourne Identity style espionage book but with a well-rounded female protagonist instead of a dull cypher. It is a familiar “who can you trust” storyline but well executed. 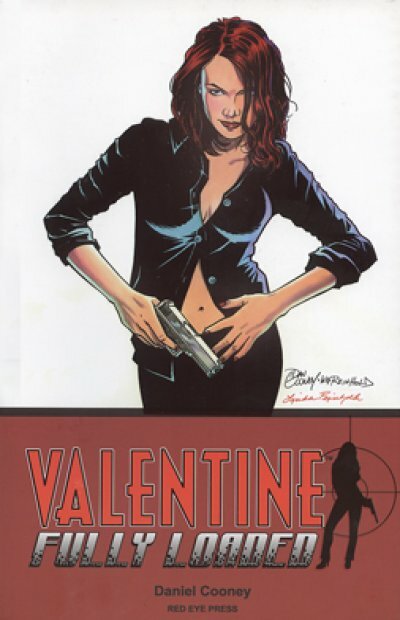 The heroine Dana Valentine is likable, believable and has a witty and audience-friendly internal monologue. The plot is easy to follow and only resorts to talking heads exposition/ bad-guy-reveals-all on two occasions. The art is black and white with some grey thrown in occasionally. There is a bit of digital motion blur but overall it feels hand-drawn. This fits very well and the white on black night scenes are well executed. All the characters have a distinctive look and are easy to identify. There are some real photographs for landscapes, pictures and computer screens digitized onto the page and this is quite a jarring contrast to the freehand style. There is a character biography at the start which could be handy but gives away too much of the plot before you read it. There is also an in-character dossier on the hero at the end which seems unnecessary. Some original sketches and design notes are also present. For a good effort, Thumbs Up! This entry was posted in Graphic Novel and tagged Daniel Cooney, Thumbs Up! by 365gn. Bookmark the permalink.